The CIE Colour Rendering Index (CRI), defined in CIE 13.3-1995, in particular the general colour rendering index, Ra, is widely adopted and used by the lighting industry, in regulatory documents and in international and regional standards and specifications. However, limitations of the CRI have been recently addressed, especially for solid-state light sources, whereby the Ra values do not always correlate well with visual evaluation by general users. This mismatch arises, first, from inaccuracies of the CRI in its intended role as a colour fidelity index; and second, from perception-related colour quality effects beyond colour fidelity. It was determined by the CIE that, for both aspects, better colour quality characterization methods are needed to measure and specify white-light sources, and the work was divided into two corresponding tasks: (1) to develop a scientifically accurate colour fidelity index, assigned to TC 1-90, and (2) to develop one or more perception-related colour quality measures beyond fidelity, assigned to TC 1-91 for initial work. 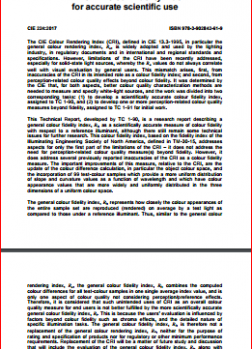 This Technical Report, developed by TC 1-90, is a research report describing a general colour fidelity index, Rf, as a scientifically accurate measure of colour fidelity with respect to a reference illuminant, although there still remain some technical issues for further research. This colour fidelity index, based on the fidelity index of the Illuminating Engineering Society of North America, defined in TM-30-15, addresses aspects for only the first part of the limitations of the CRI – it does not address the need for perception-related colour quality measure(s) beyond fidelity. However, it does address several previously reported inaccuracies of the CRI as a colour fidelity measure. The important improvements of this measure, relative to the CRI, are the update of the colour difference calculation, in particular the object colour space, and the incorporation of 99 test-colour samples which provide a more uniform distribution of slope and curvature values as a function of wavelength and which have colour appearance values that are more widely and uniformly distributed in the three dimensions of a uniform colour space. rendering index, Ra, the general colour fidelity index, Rf, combines the computed colour differences for all test-colour samples in one single average index value, and is only one aspect of colour quality not considering perception/preference effects. Therefore, it is considered that such unintended uses of CRI as an overall colour quality measure for end users is not better fulfilled by the more scientifically accurate general colour fidelity index, Rf. This is because the users’ evaluation is influenced by factors beyond colour fidelity such as chroma effects, and the detailed nature of specific illumination tasks. The general colour fidelity index, Rf, is therefore not a replacement of the general colour rendering index, Ra, neither for the purpose of rating and specification of products nor for regulatory or other minimum performance requirements. Replacement of the CRI will be a matter of future study and discussion that will include the evaluation of the general colour fidelity index, Rf, along with development of a harmonized set of new colour quality measures for assessing perception-related effects beyond colour fidelity and practical aspects for manufacturers and end-users. Excel calculation tools for the CIE 2017 Colour Fidelity Index, including a table of the spectral data of the 99 Test Colour Samples, are made available in connection with the publication. The publication is written in English, with a short summary in French and German. It consists of 52 pages with 4 figures and 12 tables and is readily available from the CIE Webshop or from the National Committees of the CIE. The price of this publication is EUR 219,- (Members of the National Committees of the CIE receive a 66,7 % discount on this price).